A partial prosthesis is a partial removable denture. Unlike a total prosthesis, some of the original teeth remain in place with a partial prosthesis. In the picture, there is a partial prosthesis fixed in the upper jaw. Partial prostheses are increasingly being replaced with implant-supported dentures. However, they are still frequently used as provisional solutions in various scenarios, such as during the implant healing period. Recently, partial prostheses made of plastic, also known as acrylic have become popular. However, these strain the remaining teeth even more than partial prostheses made of metal. Thus, acrylic is not recommended. 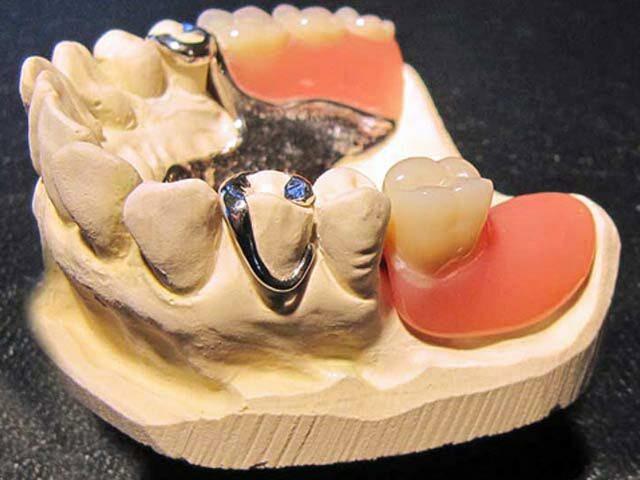 A partial prosthesis is anchored to the remaining teeth by different retaining elements. The retaining elements are classified as bracket and bracketless elements. The most common retaining element is the molded bracket. For comparison, see the Video about partial Prosthesis. The curved bracket should only be used as a short-term option because it puts immense strain on the bracketed teeth. Bracketless retaining elements include a large number of anchors and joints. These anchors are installed into the prosthesis and the anchor tooth crown. The bracketless construction improves esthetics, but the anchor tooth experiences more strain. The anchor teeth should experience less strain with specific prosthesis geometry. This geometry is rarely used in everyday operations, mostly because the technician values prosthesis stability and esthetics more than functionality. If optimal prosthesis geometry is implemented, prosthesis fractures are more likely. Optimal prosthesis geometry is explained using the following example. Here is a lower jaw with few remaining teeth; the 6th tooth is a prosthetic tooth. The prosthetic bracket is retained on the 5th tooth. The bracket is open towards the front of the tooth. This construction is incorrect. While chewing, the prosthesis yields slightly because of the mucosa, and this yielding leads to bracket deflection. Bracket deflection means the bracketed tooth is lifted upward by the bracket, or the bracket is activated. Now imagine the prosthesis being lifted up while chewing gum. In this case, the bracket is detached from the tooth, or is deactivated. To be more exact, the bracket is activated while chewing and deactivated when detaching forces are in effect. The bracket should be designed to open towards the back of the tooth. Brackets that are open towards the back of the tooth are deactivated during chewing and activated when detaching forces are applied. Furthermore, the lever arm has to be extended. The bracket is now located on the 4th instead of the 5th tooth. Unfortunately, this makes the bracket more visible. However, the extension of the lever arm reduces the strain on the anchor tooth; this is a correct prosthesis construction. Despite such finesse—and regardless of whether it is the anchor or bracket—a partial prosthesis strains the remaining teeth, especially those on which the prosthesis is attached – the abutment teeth. Over time, this leads to loss of abutment teeth and expansion of the prosthesis. Eventually, the last tooth is lost, necessitating a total prosthesis. Nowadays, these problems are much less prevalent owing to improvements in the field of implantology.